The African-American & Latino Scholars Program at Brookline is designed to enhance the culture of high achievement among students of color. It is about helping Brookline High School reach its fundamental academic goal, an achievement profile that reflects the diversity of our student body. This program is generously supported by the BHS Innovation Fund. For more information, contact Stephanie Hunt or see AALSP program pages. B-CASA is a community effort to address the underlying contributing factors of teen substance use and to offer effective strategies to counter the culture of acceptance of underage alcohol use. Brookline Tutorial is a one-credit course offering content area academic support for 10th through 12th grade students with the overarching goal of maximizing student achievement. Each class section (comprised of ten students with two content area teachers) meets four times a week in a supportive learning community. In collaboration with their Tutorial teachers, students identify specific goals for improving academic performance and receive individual guidance in developing effective study strategies. Class time is divided between personalized consultation (in which a Tutorial teacher assists the student in identifying more effective and efficient study habits) and independent practice (where the student implements recommended strategies). BRYT (Brookline Resilient Youth Team) is an initiative to support the reintegration of students who have been out of school and/or hospitalized due to an emotional, medical, psychiatric, or substance related issues. It is led by a collaborative of parents and staff from Brookline High School and the Brookline Center. The Mission of the Brookline High School China Exchange Program is to foster personal connections and a climate of mutual cultural understanding between the people of China and the United States. Each year, the China Exchange Program brings a group of eight high school students and one teacher from the Gao Xin School in Xi’an, China for a semester at Brookline High School, and a comparable group from Brookline High School to the Gao Xin School. The program provides participants with an opportunity for personal growth through increased cultural awareness, foreign language competency, and the maturation associated with navigating a new environment. The China Exchange Program enriches the communities of both schools far beyond the impact on the students and teachers who have directly participated since its inception in 1999. The program has fostered a much broader set of personal relationships among members of the two cultures involving school and community leaders, students and faculty, host families and other community members. It is also a powerful symbol of and focal point for the value that Brookline and Xi’an place on mutual understanding in an increasingly interconnected world. The Global Leadership Program aims to prepare students to understand the challenges of the 21st Century, and to lead for a more prosperous, equitable and peaceful world. The Program includes a class and several trips and a club. Students may participate independently in any of the activities. Any student apply to participate in a trip. The class is open to 10th-12th graders and students must apply the previous March for acceptance to the class. The trips are designed to provide students with exposure to leaders in human rights, public health and other work that is global in nature, and to cultivate cultural awareness and cross-cultural communication skills. The course emphasizes recent and current global challenges and exposes students to professionals committed to addressing war crimes, epidemics, and development. Further, students will work frequently in groups and collaborate on design and problem solving challenges, and will practice debate, negotiation, data analysis and leadership. In all of the Program activities, students will develop a global perspective and gain greater insight into the complexity and urgency of challenges that are a concern to us all. For more information, contact Roger Grande and see our website. 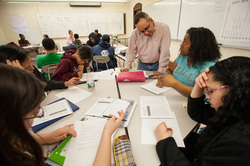 The Brookline High School Program in Social Justice Leadership trains a youth corps of social justice advocates and aims to nurture life-long leaders for social transformation—a powerful antidote to the recent decline in civic engagement and a response the growing demand by students to learn about and work for social justice. Participating students will grapple with the bedrock values of social justice—Commitment, Courage, Compassion, Humility, Praxis—and produce a social justice mission statement. Students will attend a bi-weekly seminar, blog and journal online, participate in trainings and intern at a local social justice organization. These experiences emphasize collective rather than individual responses to injustice, and transformative rather than temporary relief from social problems. The program is supported by The 21st Century Fund and is open to all juniors and senior applicants who can demonstrate maturity, a desire to participate, and a proven ability to fulfill commitment. Steps to Success (STS) is a comprehensive educational achievement program providing academic, social development and family support for low-income students and their families. Working with students in Grades 4-12, the program seeks to break through the attitudes and substantive barriers -both personal & institutional - that can make it difficult for these students to succeed in school and pursue a college education.